Weighty Matters: Badvertising: Mott's Fruitsations miracle sauce. 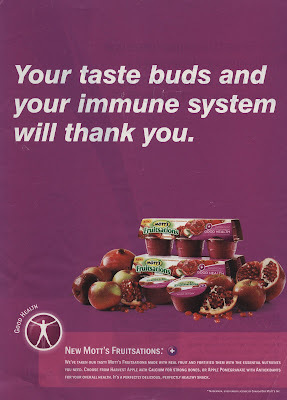 "Your taste buds and your immune system will thank you." Because they've got shares in Cadbury (the owners of the Mott's brand)? Because they're not fond of you and like to laugh at you behind your back? Because they've got a bet going that they think you're too dense/harried/pre-occupied/distracted/lazy to see through shameful badvertising? Have I been out of medical school for too long? Maybe it's the current standard of practice to prescribe apple sauce to treat a myriad of conditions. All hail apple sauce - purveyor of health, banisher of disease and ambrosia of the gods.